Every aquarium keeper has likely had to deal with an algae problem. 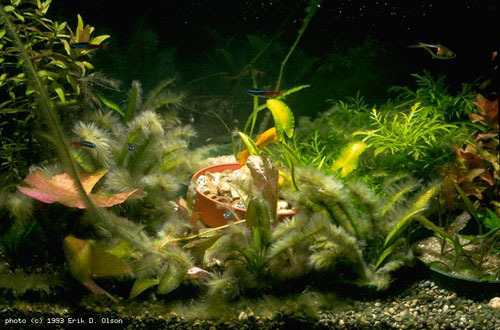 In a planted aquarium, an even more complex set of variables can easily go out of whack, and end in a sad algae state. Iâ€™ve combined information from a few different websites, added some personal experience, and have hopefully assembled a complete reference for the most common types of algae seen in the planted aquarium, along with their causes and cures. Black brush, or BBA, algae can be one of a number of specific genera of â€œredâ€ algae in the Rhodophyta family. Most of the algae in this family are actually marine, but a few freshwater species exist that particularly target our planted aquariums. This algae may be black, brown, red, or green in coloration, and can quickly coat your plants and hardscape if not kept in check. Nutrient Imbalance – potentially excess N, P, Fe. Strive for the following nutrient levels: N (10-20ppm), P (0.5-2ppm), K (10-20ppm), Ca (10-30ppm), Mg (2-5ppm), Fe (.1ppm). Low pH – Neil Frank observes that African Rift tanks never have BBA. Itâ€™s believed that BBA thrives in acidic environments, which is unfortunately what most plants prefer. Increase CO2 – This will stimulate plant growth, which should help the plants out-compete the algae for resources. Excel/H202 treatment – Use a syringe to spot treat problem areas. Then manually remove when BBA turns grey/white. Manual removal – Use toothbrush to remove as much as possible. Bleach treatment – Dip affected hardscape items/hardy plants in a bleach/water solution using a 1:20 ratio of bleach to water. Before putting them back into the tank, make sure the item is free of bleach odor. OxiClean treatment – Dip affected hardscape items in a OxiClean solution, making sure you only use the original OxiClean with no other additives. Maintain proper water change/dosing schedule – weekly / bi-weekly changes. 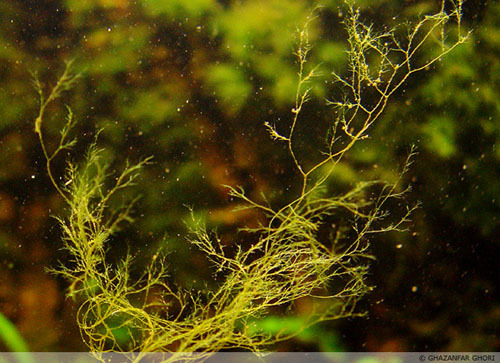 Algae Crew – Siamese Algae Eaters (SAE) and Amano shrimp are known to eat this algae. Copper (not recommended) – There are commercial algaecides containing copper that will kill BBA, but they will mostly likely also kill your plants. Brown Algae, or diatoms, often present themselves as a brown, muddy, muck that covers plant leaves and hardscape items. It is rare to be seen in a fully established aquarium. Newly setup tank – Aquariums that have just been setup seem to be prone to diatom algae. Excess nutrients – Silica in particular appears to be a trigger. Contact your water utility company for a report detailing silica concentrations in your water supply. Possibly old bulbs – Sometimes, old bulbs can encourage the conditions for diatom algae. Time – Allow it to use up the excess silica, and it will often disappear on its own. Manual removal – Siphon/scrape diatoms manually for quick removal. 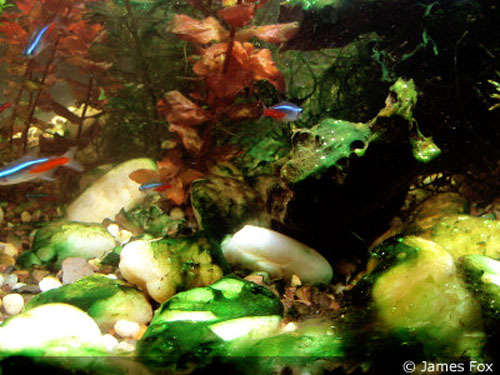 Algae Crew – Otocinclus and Nerite snails are fantastic at clearing a tank of diatoms. They help with other sorts of algae as well. While often referred to by aquarists as an algae, Blue Green Algae (BGA) is in fact a bacterial slime that can easily coat everything in your tank. Appearing as either a green, black, or purple coating, BGA is perhaps best known for the unique earthy smell that it has when pulled from the tank. As a nitrogen-fixing bacteria, it will fully deplete your water column of any available nitrogen. Low nitrates – Usually present when all of the nitrogen/nitrate has been removed from the water column. While this is a triggering condition, it is also exacerbated by the bacteria itself using any remaining nitrogen. High organics – Overfeeding, or excess organic matter in the tank can trigger BGA. Old light bulbs – Sometimes present when light bulbs are no longer emitting usable light. This may be more of a matter of your plants no longer being able to out-compete the bacteria. Poor water circulation – Circulation is key in a planted aquarium so that no â€œdead spotsâ€ are present where nutrients have been used up locally, but fresh ones are not being recirculated throughout. Increase nitrates – Dose nitrates until the concentration reaches ~5ppm. 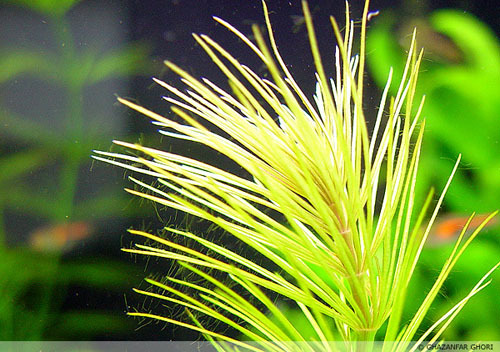 Add fast growing plants – this helps to out-compete the algae for resources. Blackout – BGA cannot survive without light. Excel/H202 treatment – Use a syringe to spot treat problem areas. Then manually remove dead patches. Erythromycin – use antibiotics at half dosage to kill the bacteria. Mardel Labsâ€™ Maracyn contains erythromycin and has been used effectively without harming most plants. Cladophora is by far the toughest algae to remove from the aquarium. Forming green, tough, wool-like mats, it seems to favor intermingling itself into hairgrass, substrate, and hardscape items. Marimo Balls – Being in the same family as these algae balls, they can sometimes introduce Cladophora to your aquarium. Healthy Conditions – Unfortunately, Cladophora seems to favor the same healthy water conditions that your plants require. Manual removal – Use toothbrush/tweezers to remove as much as possible. Excel/H202 treatment – Use a syringe to spot treat problem areas. Luck – Very difficult to 100% remove. 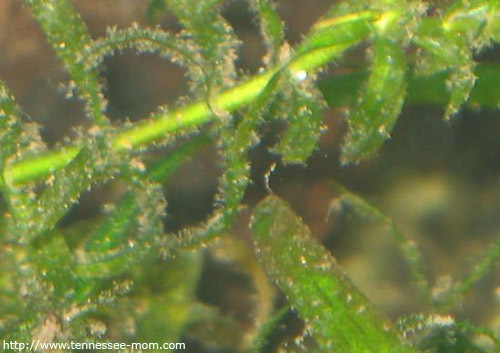 Fuzz algae often shows up on plant leaves giving their edges a slightly fuzzy appearance. Nutrient Imbalance – Strive for the following nutrient levels: N (10-20ppm), P (0.5-2ppm), K (10-20ppm), Ca (10-30ppm), Mg (2-5ppm), Fe (.1ppm). Low CO2 – Strive for 20-30ppm concentration of CO2, as permitted by fauna. 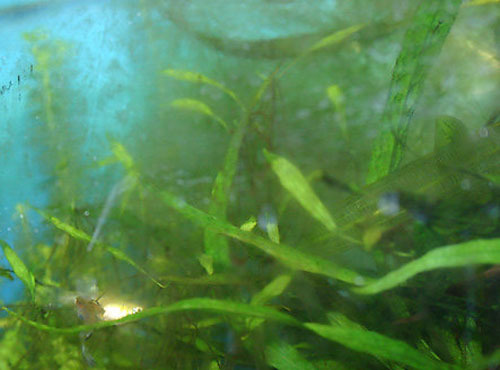 Algae Crew – Siamese Algae Eaters (SAE), Amano shrimp, Otocinclus, and Mollys are known to eat this algae. 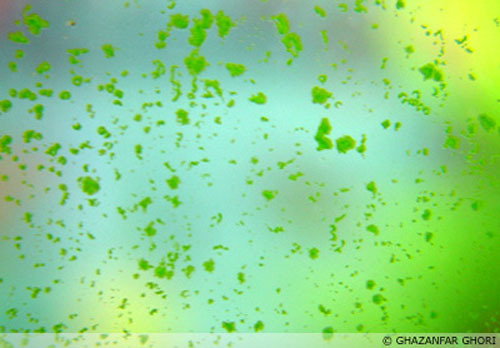 Green Dust Algae (GDA) is a â€œdustyâ€ green film that appears on the surface of the glass. Itâ€™s caused by zoo-spores, and seems to avoid attaching to hardscape items or plant leaves. Unfortunately, I havenâ€™t been able to locate a concrete cause for GDA. Leave alone – GDA appears to have a finite lifecycle, so that if you allow it to run full cycle without scraping it from the glass, it should harden, and fall off after roughly 21 days. After this time, scrap any remaining GDA from the glass, and do a thorough cleaning and water change. Nerite Snails – Nerite snails can help eat through some of the GDA on the glass, but the approach above will likely have to be undergone for full removal. Green spot algae is very commonly seen on the glass of tanks when there hasnâ€™t been a water change in awhile, or when an inadequate fertilization scheme has been conducted. GSA also appears on long lasting leaves, such as Java Fern, Anubias, and Bolbitus. Low phosphate (PO4) levels – almost exclusively caused when phosphate levels are depleted. Scrap glass – Use a razor blade to most easily remove from the glass. Dose Phosphates – Dose PO4 to a concentration of 0.5-2.0ppm. Nerite Snails – Nerite snails can help you remove green spot from leaves, as well as, the glass. Green water is free floating single-celled euglenoid protists. It contains chlorophyll a and b, plus carotenoids, giving them their green coloration, but they are not plants. With over 40 genera of Euglenoids and over 1000 species, this form of algae is one of the most abundant forms of life on the planet, and is an essential part of the food chain. Unfortunately, aquarists donâ€™t want it in their tanks. Initial Setup – Usually present shortly after an aquarium is initially setup, prior to the full establishment of the microorganisms (free-swimming plankton that feed upon it). Medication – if the medicine affects the biofilter of the tank. Blackout – leave the lights out, and block out any ambient light from the tank for 5 days. Your plants have reserves that the algae does not, so they will survive, but may look a little ratty for a week or so. Diatom/Micron Filter – fine particle filters can clear the water. UV Sterilizer – zaps the algae with ultraviolet light, clearing the water. Some reports say that UV light also affects nutrients in the water column. Daphnia – Placed in a breeder net, the daphia will consume the algae. Small Water Changes – do small (5-10%) water changes, every day until clear. Avoid large water changes, as that prevents microorganisms from establishing themselves. In addition to the cures, make sure to identify and eliminate the source of the problem, or it may return. 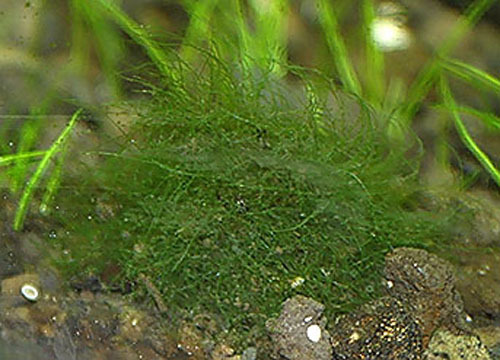 Hair/Thread Algae consists of long green filaments reaching as long as 30cm in length. 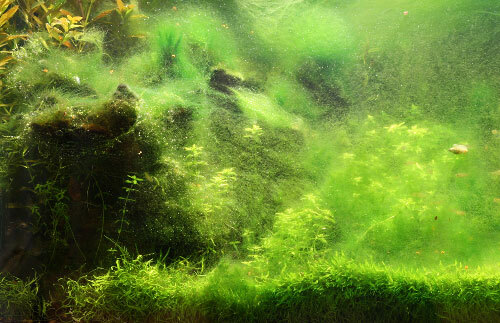 It often mixes itself in among moss, and is sometimes grown purposely as an extra food supplement for tank inhabitants. Maintain proper water change schedule – weekly / bi-weekly changes. Rebalance Nutrients – Strive for the following nutrient levels: N (10-20ppm), P (0.5-2ppm), K (10-20ppm), Ca (10-30ppm), Mg (2-5ppm), Fe (.1ppm). Staghorn algae is aptly named as its branching resembles the antlers of a stagâ€™s horns. They are coarse, branching strands that commonly attach to plant leaves and equipment. The strands can appear white, grey, or green in coloration. Water change – Maintain weekly/bi-weekly water change schedule. Bleach treatment – Dip affected items/hardy plants into a bleach/water solution using a 1:20 ratio of bleach to water. Before putting them back into the tank, make sure the item is free of any bleach odor. Most fish/inverts will not eat staghorn algae.